Magento is one of the most widely used ecommerce platforms in the world and currently powers more than 400,000 online stores. Its popularity can be attributed to two factors: open-source (which makes it customizable) and third-party developer support. The issue with getting a Magento theme made from scratch is that it can be prohibitively expensive. Magento is quite an impressive piece of software, but it is fairly complex and has a significant learning curve. Because of this, Magento developers tend to be more expensive compared to developers for competing platforms like WooCommerce. Fortunately, you have the option of going for a pre-built Magento theme, of which there are hundreds available. What’s more, there are even free Magento themes available if you’re on a tight budget. If you want to leave a good impression on your site’s visitors, the right theme will make all the difference. In this article, we’re going to be taking a look at Magento themes – how to install them, where to get them and which ones to use for your next ecommerce venture. Where to Get Magento Themes? Premium themes for Magento tend to cost more than their WooCommerce or Shopify counterparts. As such, you can expect to pay anywhere from $49 to more than $200. 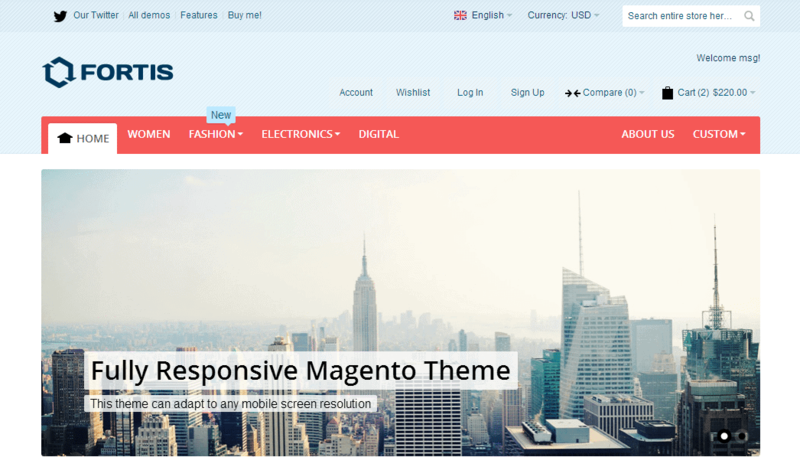 In fact, on the official Magento Marketplace, we found a theme that costs $499. 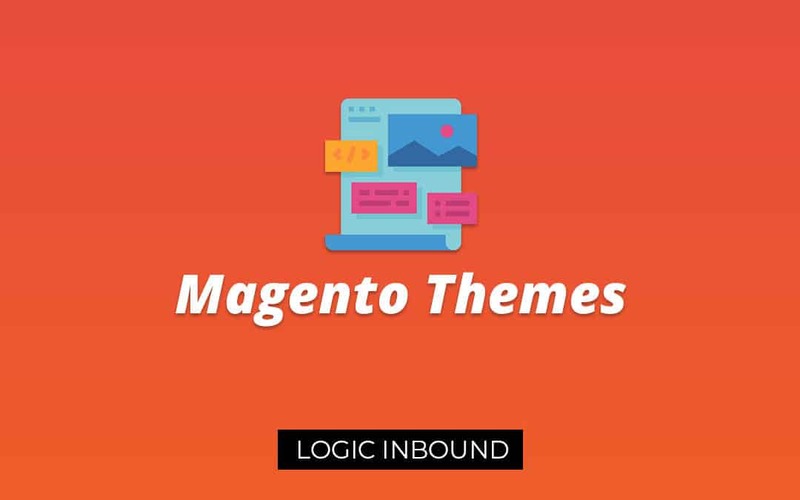 It should be noted that the official Magento Marketplace has around 14 themes in total and is not really a recommended source (in our opinion) of high quality modern themes. Now that you know where to buy premium themes, let’s take a look at some great free Magento themes before we jump into our premium theme recommendations. Below we are going to list free Magento themes that we consider to be great for any professional Magento store. 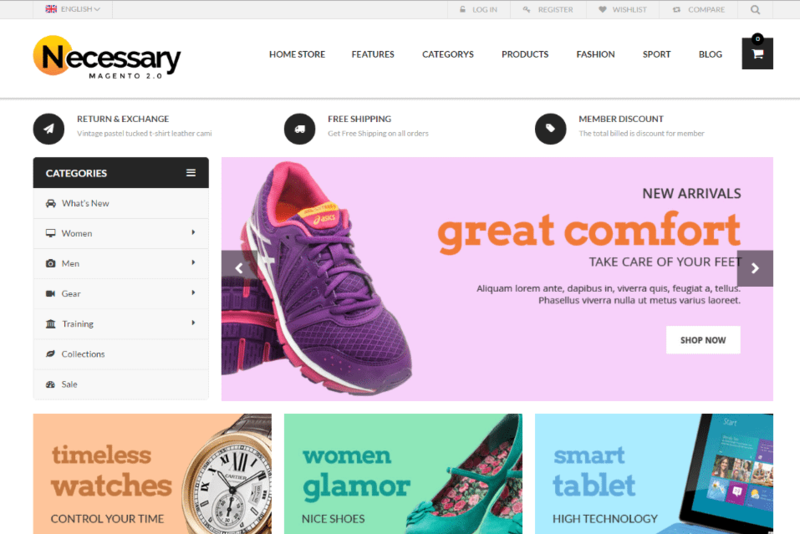 EM Necessary is a well-designed, modern Magento theme that is easy to work on and can be customized to quite an extent. It is a general usage theme that isn’t really tailored any specific type of ecommerce niche. That said, we would recommend stores with medium-to-large inventory sizes to use this theme, as there will be a lot of wasted space if it’s used to showcase a small inventory. The theme has a convenient slider on the homepage which can be used to display featured product. There are also several category images below the slider. Upon hovering over product images, the user has a choice of product quick-view, so they can quickly get the important details of the product which in turn makes the buying process easier. 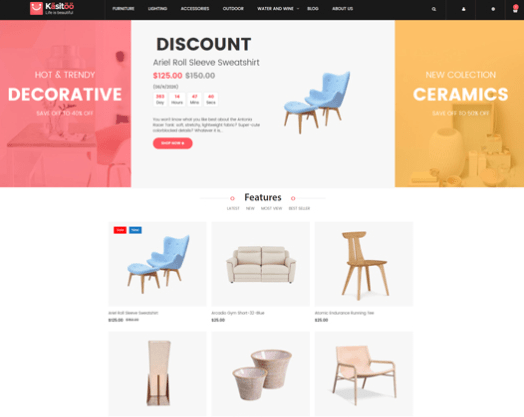 We really like the clean and unfussed aesthetic of this theme, and it can serve the purposes of a variety of ecommerce niches. Ketty Magento 2 is a modern, minimalist theme that will be an excellent choice for small clothing brand with a limited inventory. The whole aesthetic is dominated by bold images, which are great for displaying apparel and accessories. The theme has an ‘airy’ and light feel to it and is a breeze to navigate. 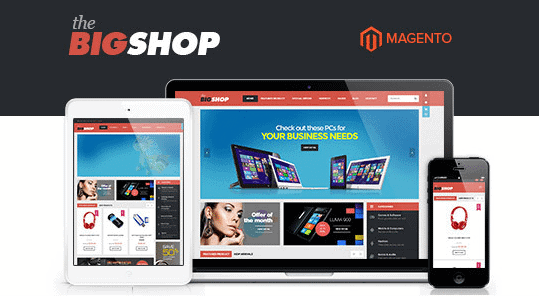 Your customers will have a pleasant experience browsing around your store if you use this Magento theme. We’re quite surprised that this high quality, responsive Magento theme is free. A professional store setup with this theme is also offered but that will cost you $399. 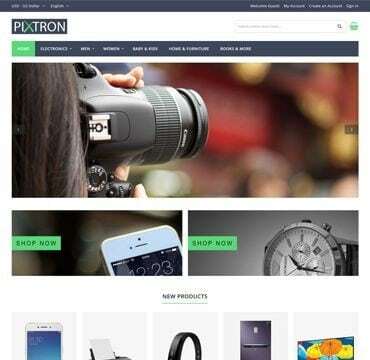 Pixtron is a Magento theme which comes with a design that is optimized for an online electronics shop. The design is not a hundred modern neither is it very minimalist, but then not everyone is looking for a theme like that. What the Pixtron lacks in modern design aesthetics it makes up for in its hassle-free navigation and intuitive site layout. This site is not going to be the best option if you want to make a visual statement, but if you’re looking to sell electronics using a site interface that is familiar, safe and convenient, the Pixtron theme is a good choice. It is mobile-responsive, as all themes should be and comes with 1-click installation of the demo content. That means that you can have your site laid out as you see in the screenshots with just a single click. This gives you a good starting point for the rest of the site customizations. BizKick is made by the same developer that makes above-mentioned Pixtron, but this time the theme is geared more towards an apparel or accessories store. It could very well be used for any type of industry, but with its slim menu design and monochrome color scheme (default), it looks like a website to get trendy apparel from. The homepage of the theme is dominated by a slider, which can be used to showcase offers or new products. Below that there are three category images, after which some featured products are displayed. It’s a well-organized and clean layout, albeit one which is quite generic-looking. Like the Pixtron theme, BizKick comes with 1-click installation of demo contents, which will certainly save a lot of time and will provide you with a blueprint you can customize. Still, this theme is absolutely free and you can download it right away. The interesting part is that it comes with professional installation for just $19, which can be a good deal if you’re in a hurry and want to get started on other aspects of store development. If you are an apparel brand and want to make a strong statement to your customers, the F2 theme for Magento can help you do exactly that. This is fully modern theme with bold image elements, which are excellent for showcasing visually appealing products like apparel. One recommendation from our side is that in order to take full advantage of this theme, you need to have great product photography. Without compelling product photography, this theme won’t really be able to perform to its maximum. On the technical side of things, the theme comes with a fully responsive design and is optimized for mobile use as well. The product page is elegantly crafted and shows the options and details in a minimal layout. The developers say that it has “not been overloaded with visual effects” to ensure you get the fastest loading times. Ves Bakerop is a stylish and modern Magento theme that has been designed for stores selling food and baked goods. The website has a pleasing effect on the viewer, along with plenty of space for placing images of some delicious-looking eatables. The theme comes with its own live editor, which makes editing and customizations a mucn more convenient affair as you can see the changes happen as you make them. The site is fully responsive and optimized for viewing on mobile devices and comes with some degree of SEO optimizations as well. A decent choice for online bakeries and specialty food shops. 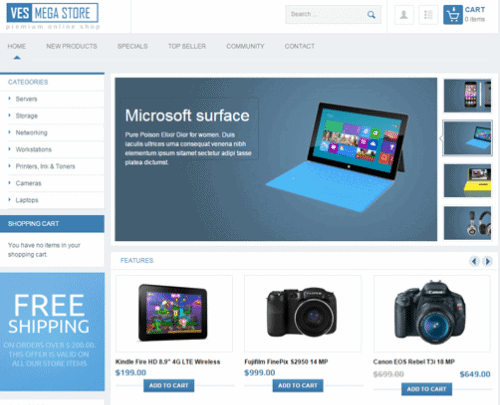 The Ves Megastore theme has been created for stores that deal with a diverse product lineup. The homepage has an image carousel slider along with a left menu (in addition to the main navigation) that can be used to list/link the various product categories. Aesthetics wise we quite like the Ves Megastore theme. It is definitely an understated design, but it’s made to be functional and intuitive rather than overly attractive. Your customers will have a pleasant time going through different kinds of products as this theme conveniently breaks the homepage into several neatly organized block sections. The theme is fully responsive and is ready to be used on any kind of mobile device. 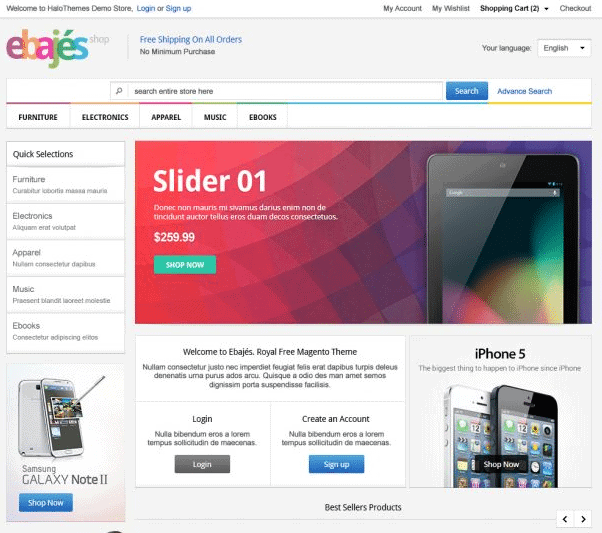 The Ebajes theme is highly reminiscent of the site design that eBay uses, and has a very similar name as well. Anyway, we think this is one of the most attractively designed free Magento themes available today. The aesthetic is clean and modern but there are colorful accents that give it a vibrant look. It’s something that breaks away from the single-color palette of most websites and makes it interesting to look at. In practical use, we think it will go along great with stores that have several different categories of products to offer. Electronics shops, online grocery and all manner of other ecommerce niches can utilize this theme. Visual effects have also been used to a minimum here, so this theme loads pretty quickly. Oh, and it’s fully responsive and mobile-optimized. Yume is a free Magento theme that comes with a very bold design. It’s filled with vibrant colors and striking images with lots of negative space. The negative space helps give it a clean look while bringing attention to the products you choose to feature. The default color scheme hinges on the ‘playful’ side, which is why we would recommend this theme for stores that carry baby items or kids clothing. The theme is fully responsive and should work well with all mobile device. It comes with features such as an off-canvas menu and header link. Ves Kasitoo is a theme that will prove to be a great fit for furniture and DIY (or not) home improvement online stores. It has a clean and modern design with some well-chosen color accents. The site is quite pleasing to the eye and, as long as you use great product images, will probably be well-received by your visitors and customers. The site is responsive and ready to be accessed by mobile devices and includes a few handy features such as a deals carousel and deal countdown timer. Now we’ll be taking a look at some of the best premium Magento themes available today. We have made it a point to only include responsive themes, as we feel it’s a basic requirement for any modern and professional ecommerce shop. 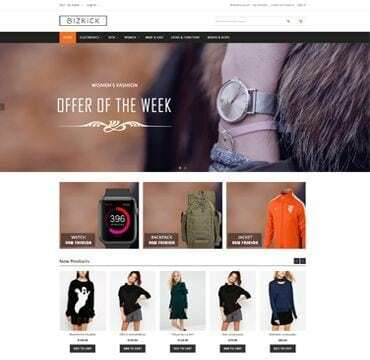 The Vini theme has been designed for fashion apparel and accessories stores and comes with a homepage that is dominated by large and bold images. The large image boxes can be used to display beautiful clothing items and accessories. The slider image will take most of the visitor’s screen space, so it presents a great opportunity for you to showcase special offers and new products. The theme is responsive and comes with some useful filters (Ajax filter, Ajax compare) to enhance the visitor’s browsing experience and make the task of finding relevant products easier. A neat visual effect on the category page is that hovering over a product will automatically expand it and display important details such as price and an add to cart button. 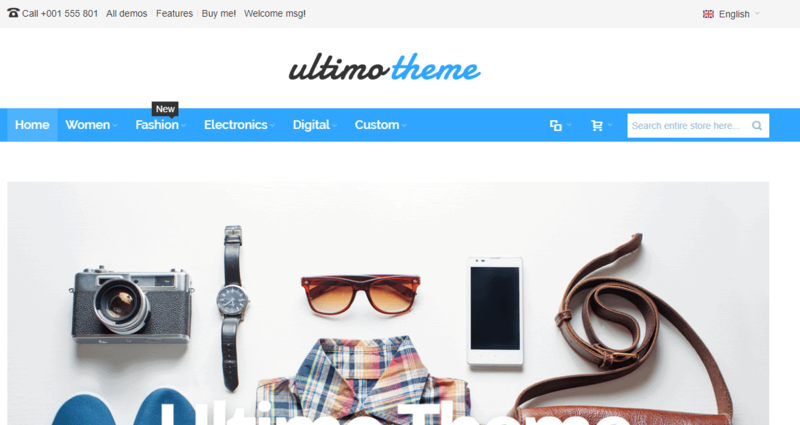 Ultimo is a hugely popular Magento theme on ThemeForest, with almost 20,000 sales to date. What makes it so popular, well that’s mostly down to its easy customizability and flexible design. The theme can take on any shape that you want it to and can be molded to be used by almost any ecommerce niche out there. By default, the theme comes with 8 ‘demo’ layouts that provide a decent foundation for you to build on. Of course, every aspect of the theme is customizable so there’s a lot of room to add in your personal design changes. The product pages are well-designed and have a clean interface. If you’re looking for a reasonably priced and fully customizable Magento theme, then you should highly consider Ultimo. Shopper is a well-designed Magento theme that can easily be categorized under the ‘general use’ category. Even though its default demo content features images that would normally be in a fashion store, the layout is quite ‘conservative’, which makes it a great option for many other ecommerce categories. The theme comes with the well-received Revolution Slider plugin which makes it easy to create compelling slideshows. There’s also an Ajax price slider, which comes in handy for filtering products. The product page is nicely laid out and the whole theme has a definite ‘polished’ feel about it. It also costs on the lower end of premium Magento themes, so it’s a solid option for store owners on a budget. Fortis is a fully responsive Magento theme that been built to cater to any type of ecommerce niche. It comes with a fully customizable design, and the default design is quite attractive as well. The main focus of this theme is on user experience and usability, so it’s certainly on the conservative side when it comes to its overall feel. According to the developers, every aspect of this theme is customizable. It comes with a powerful admin panel which allows you to adjust various visual options so you don’t have to fumble around with writing your own CSS. The theme is highly rated on ThemeForest, and should prove to be a solid choice for stores with diverse product lineups. 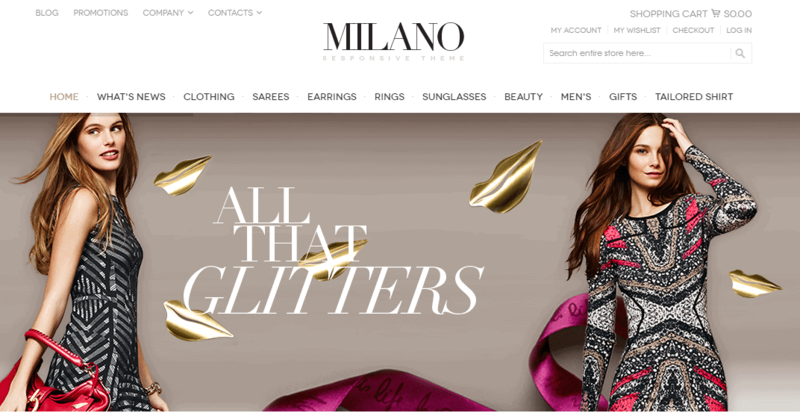 Milano is a beautiful, modern Magento theme that is a great match for stores carrying fashion clothing and accessories. The dominant color of the theme is white, which gives it a light and minimalist feel. On first sight, the theme gives off a very pleasant impression that should entice your buyers into browsing around. The theme is fully responsive and comes with convenient customization options. It also comes with several useful plugins such as Color Swatch, Pinterest Blog Style, Google Rich Snippet, Ajax Infinite Scroll and Countdown timer. These plugins should give your store some high tech credentials, as well as making it much easier to browse. The theme’s developers have also optimized it for the purposes of ranking well on Google. It comes with Google Rich Snipper (which can increase your click-through rate by up to 30%). It has also been optimized for speedy loading times, and the developers claim it should load in around 1.45 seconds. All of this makes it great for SEO. SimpleGreat is a clean and clutter-free theme that is a great choice for a variety of ecommerce niches including adventure equipment and clothing. The theme design features a homepage with a bold slider which is a great place to feature products or display special offers. The color palette used for the theme mostly consists of flat, dull colors but you can use brighter colors if you want using the powerful admin panel. All of the theme’s sections can be customized in some way, so even if you don’t like some aspect of the default layout, rest assured that you can make it to your liking. 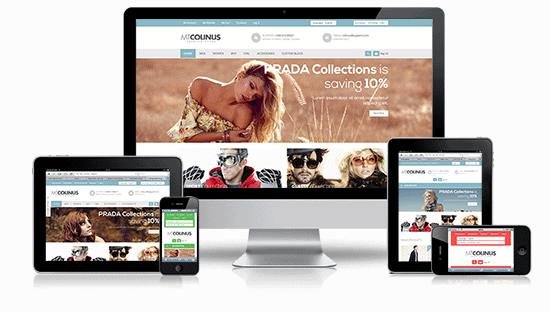 Colinus is a great all-purpose Magento theme which comes with three preset styles – red, orange and blue. Each of these styles manages to give it a unique look, and we particularly like the blue one which should prove to be a great fit for electronics stores with a small and focused product lineup. Each aspect of the theme is customizable through the admin panel. The theme includes built-in mega menus, smart menus, product thumbnail slider, cloud zoom and money other useful features. If you like the design of the theme it will serve definitely satisfy you when it comes to features. Our section for free themes features 3 of them made by developer Venus Themes. Their free themes are thoroughly impressive, and their paid Ves Fashion theme doesn’t disappoint either. When it comes to design, it gets nearly everything right. Being a theme that’s focused on fashion stores, it features a light and minimalist aesthetic that converges the user’s attention to what’s important – your product lineup. Just like the free themes, Venus includes plenty of customization options with Ves Fashion. The theme was built using Bootstrap 3 so it’s fully responsive and optimized to be accessed from mobile devices as well. The Ves Bigshop premium theme has been designed for stores that carry a diverse product lineup. It can be used for a variety of ecommerce niches such as computer hardware, technology, smartphones, fashion and so on. The layout has been designed to display a good number of products in a clean and clutter-free manner. The theme is built in Bootstrap 3 and is fully responsive, so it’s good for mobile devices as well. 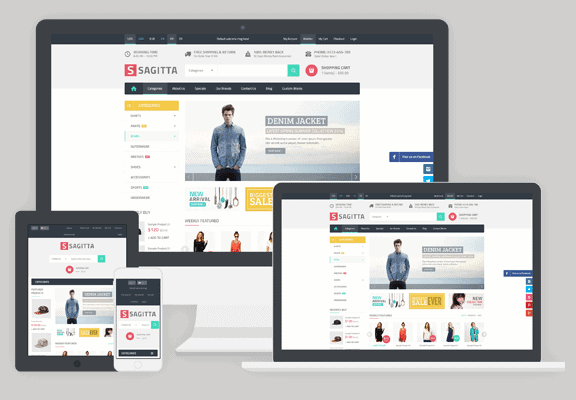 Saggita is a conservatively designed theme that can be used for a variety of ecommerce niches. The layout of the site is modern and simple and will go along great with a shop that sells products in several categories.